Now you can watch TV like a pro with the KING Quest Pro. The state-of-the-art redesigned KING Quest Pro features the first ever ultramodern clear cover. It's simply better, by design. Take your DIRECTV satellite TV service anywhere in the continental U.S. with the KING Quest Pro premium satellite TV antenna. Portable or roof-mount ready, this small, easy to use, fully-automatic antenna gives you the freedom to take your favorite DIRECTV programming with you on the road, to the great outdoors, or anywhere in between (does not provide service while moving). KING Quest Pro is fully automatic and works right out of the box with a compatible DIRECTV receiver for SD programming. The KING Quest Pro supports multiple TV viewing, so you can stay current on more than one show or live event. SWM adapter required for SWM-only receivers. Ideal for RVers, truckers, campers, outdoorsmen, tailgaters and all mobile adventurers looking for live satellite TV. TV Like Home Wherever You Roam. Those looking for a more permanent or semi-permanent setup can easily mount the antenna to the roof of their RV. Portable and compact (weighing in at only 8 lbs. ), KING Quest Pro offers a fast, effortless and reliable connection to your favorite SD channels from DIRECTV. You'll never have to miss the big game, breaking news reports, or your favorite show while out and about. 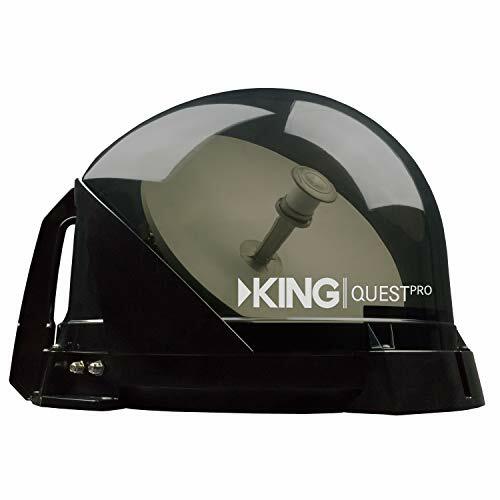 Like all of KING's mobile satellite TV antennas, the KING Quest Pro is great for camping, RVing, hunting, fishing, or at your backyard barbeque, second home, cabin, or ice fishing house. Compatible Accessories: Universal Controller for KING Quest Pro (UC1000), Quick Release Roof Mount Kit (MB700), Tri-Pod Mount (TR1000), Portable Satellite Antenna Carry Bag (CB1000), Portable Antenna Window Mount (MB500), Cab Mount Bracket (MB160). Worked great for a year then stopped working. I used the same receiver each time.